At first glance our feature article on early legends about Jesus’ birth and childhood may seem quite remote from our daily lives but it is as timely as the latest headlines. In order to understand these legends, we need to discern their purpose. While we would be unlikely to tell such tales today, those who crafted these legends intended to give hope and meaning for the people who first heard them. It has always been important for us to be able discern the reason why what we read and watch has been created. Such discernment is a vital survival skill in an era of fake news and competing claims about whether reports are true or false. An experienced photojournalist once showed me how a photo taken of the same image can be framed and focused to tell very different stories. He had been smoking a cigarette and placed it in an ashtray. He adjusted the lens of his camera and invited me to look through the viewfinder. The scene was disgusting and ugly, one he would take for an anti-smoking campaign. He readjusted the lens. Now the smoke curled from the cigarette in an appealingly tantalizing way, one he would take for a cigarette ad. We tell each other stories for many reasons; sometimes simply to entertain, at others to persuade or influence people to think and act as we prefer, sometimes for the best of reasons, at other times for quite sinister purposes. 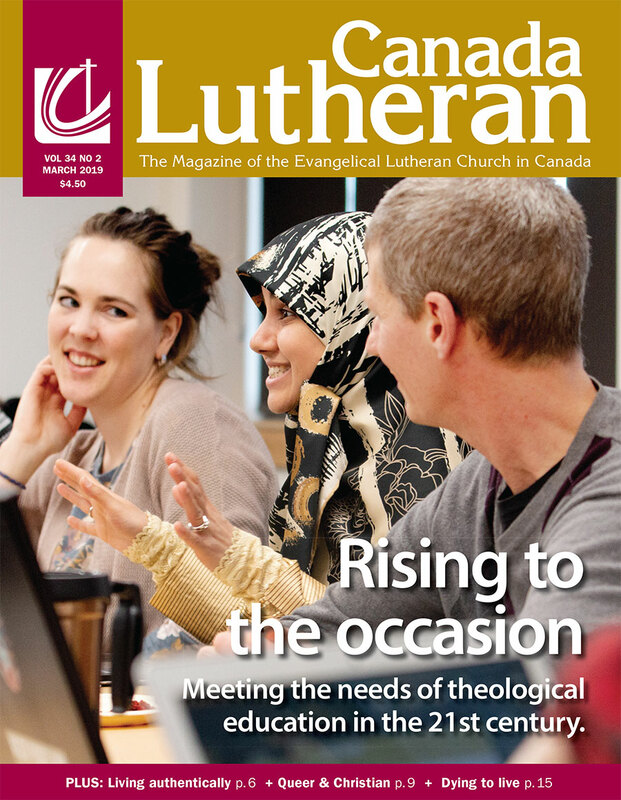 Canada Lutheran seeks to inspire and inform our readers. The Evangelical Lutheran Church in Canada focuses on being In Mission for Others. Our writers, photographers, designers, artists and editors take care to craft each item in this and every issue to reflect those goals. Each person brings a unique perspective, with its own biases based on that person’s experience. In spite of our best intentions, sometimes these need to be challenged, broadened or corrected. Sometimes the dialogue that follows brings a new perspective into focus. When that happens, we all benefit. I encourage you to take time to discern what each item in this magazine is trying to say to you about how life can be understood and lived. We need to know when something seems fake or false to you. Of course, we are always pleased to be affirmed when our material rings true for you. Bishop Sid Haugen re-tells the Christmas story with an underground parking lot as well as truckers, p. 24. What prejudices, fears and perceived threats do I need to confront in myself? p. 31. Our simplest Christmas traditions have the power to shape us for life, p. 9. I discovered an approach to truth and reconciliation that has helped me to rethink the matter, p. 28. January 2 will never seem quite the same, p. 18.